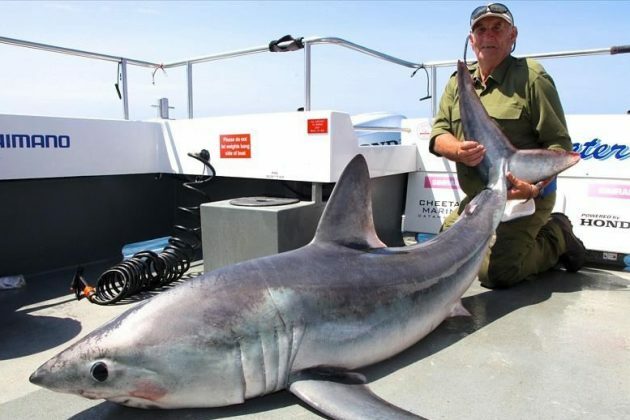 George Woodward, a 70-year-old angler from Herefordshire, UK, has landed a massive porbeagle shark weighing in at 136kg (300lb). The shark, caught off Pembrokeshire coast, could be the largest shark ever caught in Welsh waters. It took about two hours to reel the fish in, and after measuring and photographing it, Mr Woodward released the shark back into the sea. "Everyone has a boyhood dream," he said. "When I was a little kid of about four-and-a-half I thought I wouldn't mind shark fishing." Luckily his fishing trip from Milford Haven took place in particularly calm waters - and it would become memorable for other reasons. "I was beginning to realise there was something a bit serious on the end (of the line)," he said. "There was a big oil tanker near us and I thought it could be caught on that! "We got it closer to the boat and an hour-and-a-half had gone. It was something out of the ordinary. "I was beginning to think I wished it would fall off because I was in a bit of pain." But with the help of his fellow anglers and boat skipper Andrew Alsop, the shark was eventually wrestled on to the boat. They measured it and it was close to or over the Welsh record. The largest shark previously caught off the Welsh coast was about 134kg (296lbs).